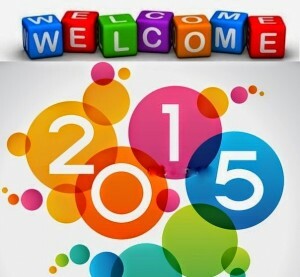 Hello 2015! - news, articles, blogs and more. Christmas is well and truly over and a new year has started, so I thought the first blog of 2015 should give you some pointers on how to grow your business, be successful with social media and market your company in the most effective way possible. Your website is quite often the first time a potential client is introduced to your business, so make sure you make a good impression. Now the New Year has started update any references to the date – many websites have a copyright date in the footer, and remove any promotions you were running in 2014 that are no longer relevant. You might want to think about giving your site a new look for 2015. New colours, graphics and layout will make your site look fresh. Responsive website design is extremely popular at the moment and Plesilium can design you a great site that provides optimum viewing experience with easy navigation and minimum resizing and scrolling across a range of devices. If you haven’t got a social media page – get one set up! Social media is as important to your marketing campaign as having a website. Not only does it get your name out to potential customers, but it actually does a lot of the leg-work for you. If someone likes your social page, this is seen by their friends, who may then like your page, whose friends will see your page etc. and so it continues. It may open up a whole new customer base that you didn’t even know would be interested in your business. Facebook, Twitter and Google+ are the most common social media sites. Studies show that many people who are looking for a new product or service will search for social media pages because they reveal more information about a business such as client opinions, number of followers, response times etc. Email marketing campaigns can be very effective. Promoting new products or special offers directly to your target market will have a bigger return on investment than blanket targeting everyone hoping that someone will be interested in your product or service. Ensure you have a genuine and relevant list of recipients and design your email so that it makes people want to learn more about your offering. Always include a ‘call to action’, whether it’s clicking through to your website for more information or visiting your social page for discount codes. At Plesilium we design and distribute custom email campaigns that reflect your corporate identity to get your message across to your target audience. For more information contact us. There are many ways to advertise your business so make sure you opt for those that will be more effective for you. Think about trialling one method of advertising first before ploughing lots of money into all advertising opportunities and hoping one of them will work. Google Ads – these will appear alongside Google search results. They are a good way to get your business to the top of Google, but can be costly for certain keywords. Facebook Ads – these are incorporated into users news feeds and tells the user if any of their friends have liked the advert to encourage them to do the same. They are a very effective way of advertising, although these ads can be turned off if the user doesn’t want to see them. The cost depends on how often you want your advert to be shown. Online directories – local directories are a valuable source of information if you are targeting your local area. Adding your business to these types of directories will help keep you ahead of your local competition. Magazine/newspaper adverts – placing an advert in a specialist magazine or newspaper will put your business in the minds of your target market. There are different sizes and placements for adverts so the cost can vary depending on where you want your advert to be. When you’re designing a new website or advert it’s easy to get carried away with the way it looks, what colours to use and the image you want to portray, but one of the fundamental aspects you must take the time to perfect is the message you want to give and the words you use to put it across. Copywriting is an art and in order to satisfy your audience and your business objects, using the right words is so important. At Plesilium we write clear, interesting, entertaining and professional copy that gets your message across. Why not give us a call to see how we can help you? I hope you find some of these tips useful. Here’s to a great 2015!